Matthijs de Ligt is a Dutch professional footballer born on 12 August 1999 in Leiderdorp, Netherlands. He plays for AFC Ajax. His primary position is centre back. 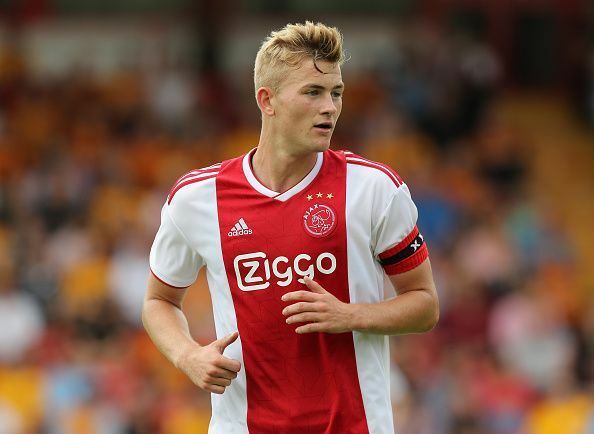 De Ligt joined AFC Ajax’s youth team at the age of 9. He was part of that team for 8 years upto 2016. Due to his good performance for the youth team, he was selected to play for the senior squad of Jong Ajax for the 2016-17 season. He made 17 appearances for them and scored 1 goal. At the age of 18 years, de Ligt made his international debut for Netherlands against Bulgaria in a World Cup Qualifier. He started in the first team but was substituted in the 45th minute in place of Wesley Hoedt. Bulgaria won the match 2-0. De Ligt became the youngest debutant for Netherlands since Mauk Weber debuted at the age of 16 years in 1930. He has 5 appearances for the Netherlands national team and has 2 assists to his name. He played one season for Jong Ajax in 2016-17. He was then transferred to the senior side of Ajax. He made 56 appearances for Ajax Amsterdam and has 6 goals and 2 assists to his name. He has been a part of the AFC Ajax team that was the runner-up in the UEFA Europa League 2016-17. He has also won some individual records like Best Player of ABN AMRO Future Cup 2015, Best Player of Copa Amsterdam 2015, AFC Ajax Talent of the Future 2016 (Sjaak Swart Award) and Member of the UEFA Europa League 2016-17 Squad of the season. Can Ajax repeat the magic of 1995? Champions League: What makes Ajax so good?